Ride with us in 2018. We have 3 options for the year. Are you looking to pin on a number this year? Then you will want to order up the Rolling H Team green! A big thanks to St. Luke’s Sports Medicine who has come aboard as our 2017 title sponsor. In 2016 team Rolling H expanded participation in local and regional Races. Crit. season saw some great road participation from a lot of team members. The Pedal Thru the Corner Crit was a display of Rolling H the likes that has never been seen before! The LP200 also had a tremendous Rolling H wow factor. Not only did all 4 teams have fun but we clearly left an impression on those we came into contact with. Off the road team RHC continued to make noise. Many riders suited up for the Jug Mountain 9-5, Team green was seen getting dirty! This event has become a must for anyone interested in knobby tire racing. Out of the state RHC continued to set the standard. The toughest 100 miles on dirt Oregon had to offer drew 5 of us from Idaho and even 1 from the UK. With Nasty Nate claiming a top 10 over all and everyone crossing the line in a race that sees over 70% DNF, RHC showed grit. Lastly in what some call the hardest sport on earth because it is actually 3 sports in 1, our triathlete stud, Mr. Jeff Mutchie, managed to race all over the continent and place 4th at Ironman North Caroline and 4th at the Honu 70.3. It was a great year but we want to take the bar up another notch! This year we are asking for commitment from our team members. In the past we have not asked for much to be “on the team” but we want to continue to raise the bar. Below you will find our 2017 team commitments and benefits. ♦ Volunteer at 3 local events. ♦ Attend 2 monthly team rides/training sessions. Decided upon by the team. ♦ Train for specific fitness levels correlating to category. ♦ Train and race at 3 races, 2 local & 1 regional. These races will be chosen by the team and the team budget will cover race entry fees for qualifying members. ♦ Attend special workshops presented for our benefit by our major sponsors. ♦ Riding in the team kit when out with the team or Rolling H advertised rides. ♦ Social media call outs when attending events and clinics associated with sponsors. ♦ Purchase and ride in a 2017 team kit. ♦ Lowest price on team kits we have ever offered. ♦ Team will cover race entry fees for qualifying members and events. ♦ Scott bikes at team price. See Adam for more details. ♦ Organized team training and support. In 2016 we started hosting ladies specific rides and events. With the level of interest we received we are excited to create a Rolling H Ladies Cycling Club, H Ladies for short. Like previous years we’ll host weekly road rides, but we’ll also have a training schedule, clinics and even a focus on mountain biking and cyclocross. You can participate in the discipline of your choosing…or all! Each rider will be supported based on their goals and riding ability and we plan to grow together, which is part of why we will provide a training plan. As a cycling club, rather than a team, we’ll take a casual but structured approach to the next season. ♦ Inclusive environment to encourage even the newest of cyclists to participate and progress. ♦ Support every rider’s growth based on their personal goals. ♦ Create a positive community for female cyclists. ♦ Make friends and find riding partners. ♦ Increase awareness of cycling in our community. ♦ Foster the growth of female cyclists. ♦ Commitment to train in addition to group rides so we can all progress together. This will vary depending on if you are riding road or mountain. ♦ Encouraging and positive attitude. ♦ Encouraged to attend at least 1 event in your H ladies jersey. 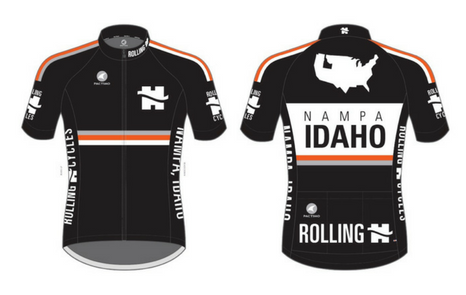 ♦ Ride in the H ladies jersey at Rolling H group events and rides. ♦ Be a positive ambassador for cycling. 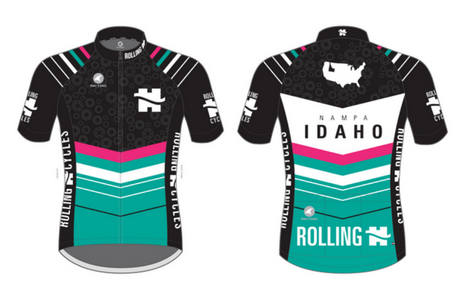 ♦ Purchase a 2017 Rolling H Ladies jersey. ♦ Support your goals as an individual rider. ♦ Make friends and riding partners. ♦ Be an ambassador for cycling. ♦ Create an inclusive group that encourages people to try out the sport. ♦ Receive and share advice and camaraderie on rides to help everyone grow and enjoy cycling. ♦ New rider? Or new to road at least? Learn the rules of the road from seasoned cyclists. ♦ Safety (and fun) in numbers. ♦ Opportunities to support events that will foster the cycling community. ♦ No club fee – just fun, fitness and friends. ♦ Lowest price ever offered for a jersey and bibs. ♦ Most people ride more when they ride as a group…so more time in the saddle.